One of the strengths of the Neverwinter campaign setting, as I stated in my review, is the inclusion of character themes. Character themes were first introduced in the Dark Sun setting as a way to tie the PC’s into the world, with a ready to go plot hook for the DM to build stories around. 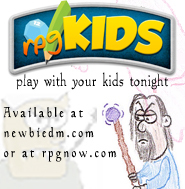 Well, anything that makes my life easier as a DM is welcome as far as I’m concerned. In my preliminary planning stages for the online game I’m planning to run centered on Neverwinter, I’m going to try to plan in a different way. Rather than the players stumbling unto plots and adventures, I’m going to craft these for them specifically instead, using the themes as my compass. 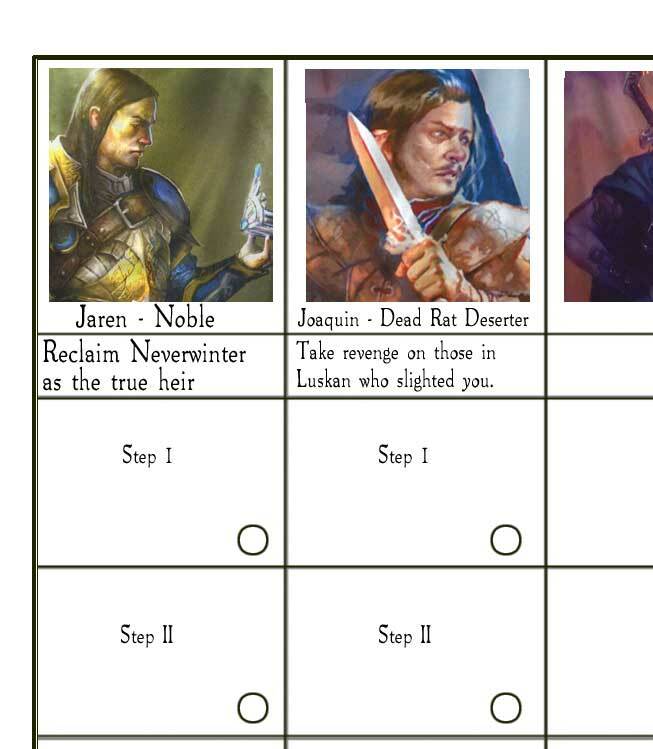 So for example, the Neverwinter Noble theme’s ultimate goal is to prove that he is the rightful heir to the throne, so off the top I know that his endgame is a confrontation with whomever currently has the crown. Simple enough, and I think I found the perfect way to do it. Back in 2009, Dave Chalker introduced his 5×5 method of campaign planning. It’s basically a bit of structure to the campaign, where you take a quest, and add 5 steps to reach its conclusion. Then you’d do the same for 4 other quests, and you’d have a whole campaign, where some of the locations would criss-cross, etc., leading to climactic epic finales for all. It’s a neat tool to plan around a “sandbox” type setting in my opinion, which is what Neverwinter ultimately is. 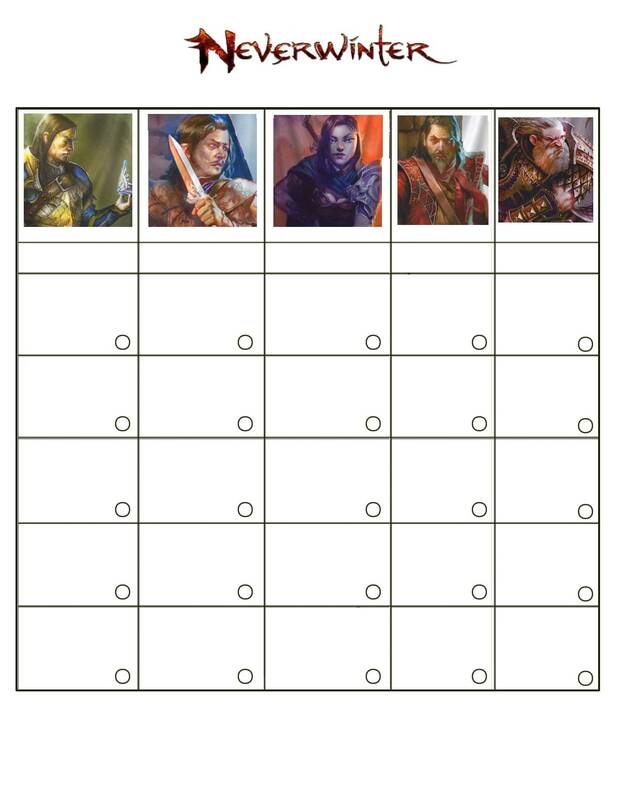 So I decided to go with a grid type arrangement for my campaign, and taking the 5pc’s and each of his or her themes, I’m going to craft the campaign around that. Each quest will be tied to each specific player. So… I actually pulled out my Hat of Nerdom and created a grid in Photoshop for my planning purposes. Now, these images are placeholders, as the party make-up hasn’t been determined yet, but it’s a great way to get me to visualize things. So, looking at the grid, under the pictures, there’s a slot for the PC’s name and theme, and directly under I’ll put his ultimate goal. Then in the squares under, I’ll fill it with a macro view of how he’ll arrive there (the circles are there for me to check off which steps have been cleared and which pc is getting too much or not enough attention as we progress). The neat part about this is that as I plan, I can come up with a way to have certain steps intersect, so that the story that pertains to one PC can also aid another PC on their quest and we knock out two birds with one stone. So for example, the Neverwinter noble is looking for clues of his lineage and finds a relic belonging to his family hidden in some ruins, while at the same time the Heir of Delzoun finds clues to the entrance to Gauntlgrym as they explore. One location, two quests knocked out, and it’s easy for me to visualize and keep track. I need to keep track of which steps would intersect, and I’m leaning towards color coding or something similar to that. There’s nothing on here because it hasn’t been planned yet, but I thought I’d share some insights into how I’m going to tackle my Neverwinter planning. I’m the type of guy that needs some help to keep organized, and something like this will help me tremendously. Don’t forget to check out Dave’s 5×5 method at Critical Hits. I like this, I’ve read about the 5×5 method before, but could not find many examples of it in play. I’d really appreciate to see your chart all filled up when you’re done. Instead of photoshop, you might want to consider using good old html. Tags for tables, images, links (to other images or posts or whatever) and anyone without Photoshop would be set. Nice idea to keep it character centric, too! If I knew how my friend, I would. Sadly I can’t program a vcr. Did I just date myself? Oops. Is there a neverwinter campaign in our future?